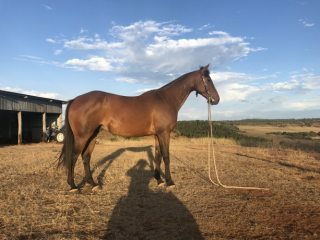 16hh 8yr old tb gelding been off the track since 2015. I have owned him since 2016. He has a lovely ,genuine,gently nature. Comes when called and always greets you. Easy to do anything with is easy in every way. Would suit intermediate level rider or confident beginner as still needs some more advanced training soft mouth snaffle bit. Has three lovely,balanced paces and Carries himself nicely and is showing promising ability in his jumping as well. Is great on trail rides alone or in company. Good to shoe, trail ride, float,catch,wash and rug.